Another wild summer, come and gone. It’s been so much easier than last summer with newborn twins, but I’m always looking forward to a change in seasons. For those college years and early years in our marriage I thought change came with moving. But Utah’s beautiful four seasons have given me just enough change to be constant like the magnificent Wasatch Mountains that surround me. And it’s enough…not to mention the ever adventure being a mother, wife, and artist ;). 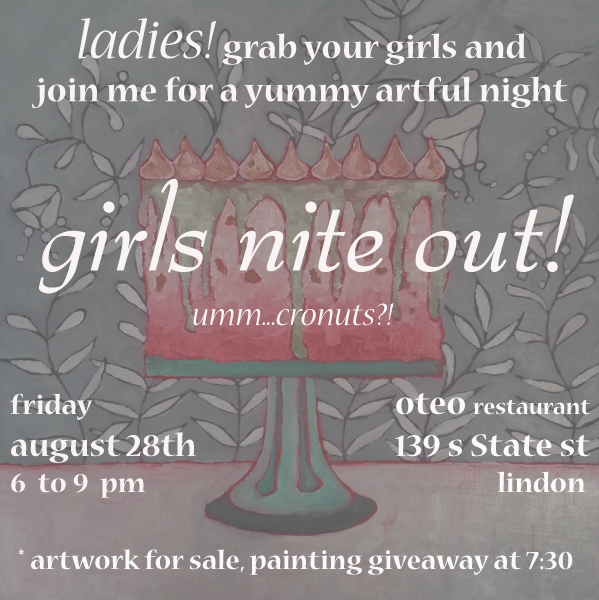 To celebrate that change, and the end of my showing at Oteo Restaurant in Linden these past couple months, I’m hosting a Ladies Night Out! Come one come all and bring your mom, daughter, besties etc.